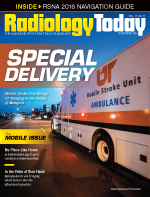 As teleradiology has grown, teleradiology providers have moved toward web-based viewers and server-side rendering to distribute images among their radiologists. Working with images in this way reduces the need for software downloads on desktop and mobile devices, which are less secure than web-based viewers. In addition to teleradiology, cloud-based image storage and management solutions have also become more popular in recent years. Chris Hafey, chief technology officer at StatRad, thinks the future of image sharing and management is in the cloud, but he sees a potential problem: Because of a property called latency, the farther data have to travel, the more lag time accrues for the end user. Hafey says radiologists are accustomed to viewing rates of 50 frames per second; in some cases, images that have to travel across the entire United States via the cloud may be reduced to rates of 10 frames per second. To address this issue, Hafey approached the problem from a different direction. "We've thought about the entire process of images being delivered from the cloud to the web and converged on a strategy that leverages client-side rendering and advanced streaming protocols to deliver pixels on demand," Hafey says. "Client-side rendering leverages the power that is built into the computer on your phone or on your desktop. Most web-based viewers don't really take advantage of the horsepower on the computer." "It's basically a smart protocol that asks how much screen resolution you have and gets the pixels to deliver exactly what the user wants in a smart way," Hafey says. "The system dynamically updates on the fly, using clinical context. It starts downloading the data over that small, narrow network pipe as quickly as it can, in anticipation of what the user's going to do. That results in a system that feels like there's no delay. It's just smart about anticipating what's going to happen and priming the pump. The end users get full speed and performance." RadConnect is FDA cleared as a Class II device for diagnostic viewing other than mammography and breast imaging, but it is able to present a digital breast tomosynthesis (DBT) study to an end user without loss of speed or resolution; Hafey says some PACS have difficulty displaying DBT studies. RadConnect also allows users to zoom, pan, scroll, adjust window and level, and take measurements in real time. "This is as fast as a radiologist would expect it to be on a diagnostic workstation, but the difference is I haven't downloaded the images to my local machine in advance," Hafey says. "I'm using web technologies, and I'm actually pulling it live from the cloud." RadConnect is based on the Cornerstone platform. Hafey is the primary author of Cornerstone, which is the most popular open-source medical imaging platform today. Hafey hopes that Cornerstone will help other organizations transition to the cloud. It is available as a software development kit that allows users to build applications. The Cornerstone-derived platform that StatRad uses for RadConnect is called Nucleus, which is available through a licensing agreement. The licensing models depend on the size of the organization. Hafey says many people have already used Cornerstone to build FDA-approved applications. "There's a class of people out there already, today, and they've been doing this the last few years: building applications on our open-source technology and having success," Hafey says. "Many of them are looking for guidance on issues like performance, scalability, security, high availability, and connectivity to PACS and EMRs in bringing their products to market, and that's where our Nucleus platform comes in. It allows them to do those things very easily and do them in a quick way." StatRad is also expanding cloud use by partnering with hospitals in underserved areas. One such hospital, Tenwek Hospital in Bomet, Kenya, which is in the southwestern part of the country, uses RadConnect and Nucleus as a cloud-based mini-PACS platform; StatRad donated RadConnect and Nucleus to the hospital. Physicians at Tenwek upload CT scans to RadConnect, and the scans are read and reported on by radiologists in the United States. StatRad also partners with hospitals in Gabon and Uganda. Hafey says StatRad is committed to further developing these technologies. He believes they offer the opportunity to solve more real-world problems than traditional systems. "Once you remove the barrier of getting images from point A to point B, it opens up the door for access to specialists anywhere in the world, which really doesn't exist right now, and it's all because of cloud and web technology that we can do that," Hafey says. "So by transforming radiology while we are leveraging these technologies, we can do it securely and quickly and in a way that is extremely high quality."